Palm Springs, California – April 2, 2010 – The historic Greystone Mansion in Beverly Hills will be the majestic venue when a magnificent collection of more than 100 classic and exotic automobiles and motorcycles gather on April 11 for the first celebration of what will become an annual event, the Greystone Mansion Concours d'Elegance. Historic celebrity vehicles from the Petersen Automotive Museum will be on display, such as Fred Astaire's 1927 Rolls-Royce and a Duesenberg owned by Rita Hayworth. More modern technology will be exemplified in the form of three new motorcycles from DiMora Custom Bikes in Palm Springs, California. Built in 1928 and expanded since, the 55,000 square foot residence is surrounded by 18 acres of gardens, tennis courts, lakes, waterfalls, stables, and even a playhouse. It has served as the opulent setting for countless movies, such as Ghostbusters, Spiderman, Air Force One, Indecent Proposal, Stripes, and Rules of Engagement. 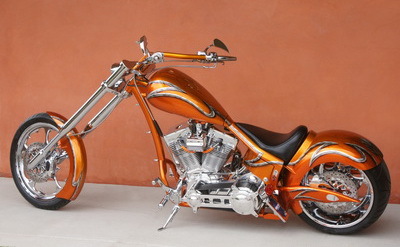 DiMora Custom Bikes will exhibit three handcrafted motorcycles at the Greystone Concours. The ZTango 300 is an easy rider softail chopper, the Knight Moves 180 is a classic pro street springer, and the Dragon's Breath 250 is an upper range softail chopper. Activities begin at 10:00 am, and include the Concours, tours of the mansion, a fashion show, live musical entertainment, and catering by renowned restaurants such as Lawry's, Spago, Porta Via, Coupa Café, Il Pastaio, and Via Alloro. Tickets include all food, drinks, and adult beverages, commemorative poster, program book, and 2 for 1 admission to the Petersen Automotive Museum. They may be ordered at www.beverlyhills.org/greystone. Based in Palm Springs, California, DiMora Motorcar crafts automobiles designed to exceed expectations in every aspect of automotive engineering. DiMora Custom Bikes takes the DiMora passion for technological innovation and uncompromising quality that is the hallmark of the $2 million Natalia SLS 2 sport luxury sedan and brings it to the motorcycle world. Its products are available worldwide through the growing DiMora dealer network. Please visit www.dimoracustombikes.com, www.dimoramotorcar.com, or www.clenetclub.com.